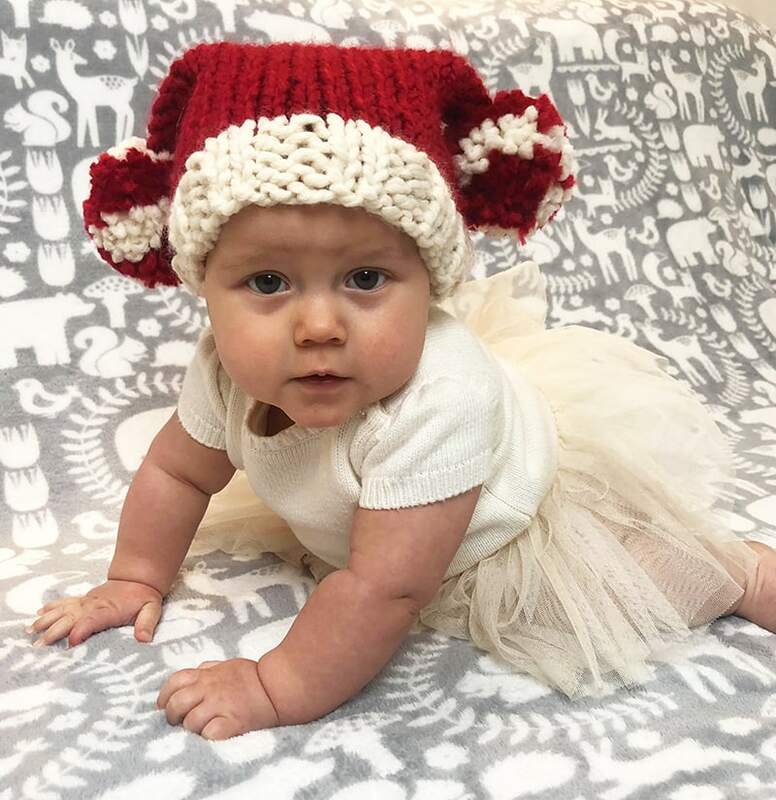 This baby Santa sack hat is the perfect accessory for the holidays! It is really quick and easy to make, knit flat on size 9 mm needles (US 13) with super bulky yarn (06). Available to make in a range of sizes, from baby through to adult. 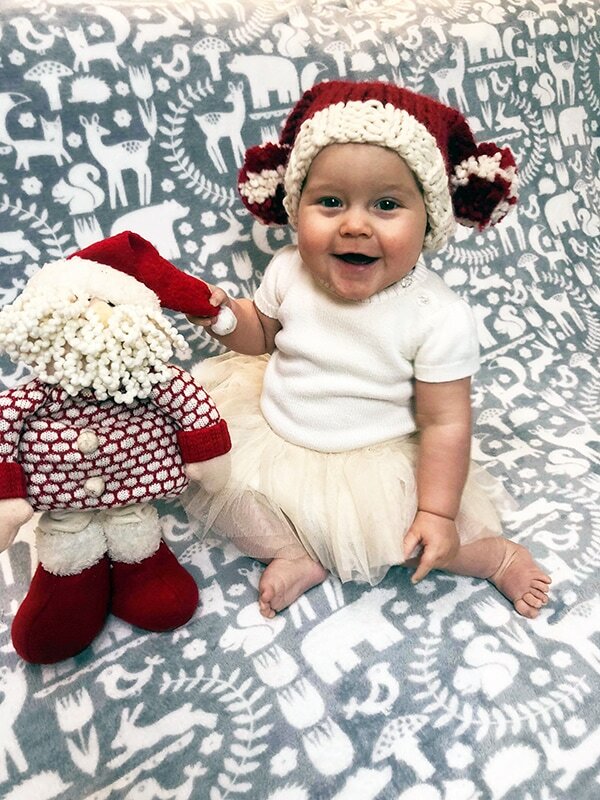 The Santa sack hat is completed with two oversized poms in white and red. 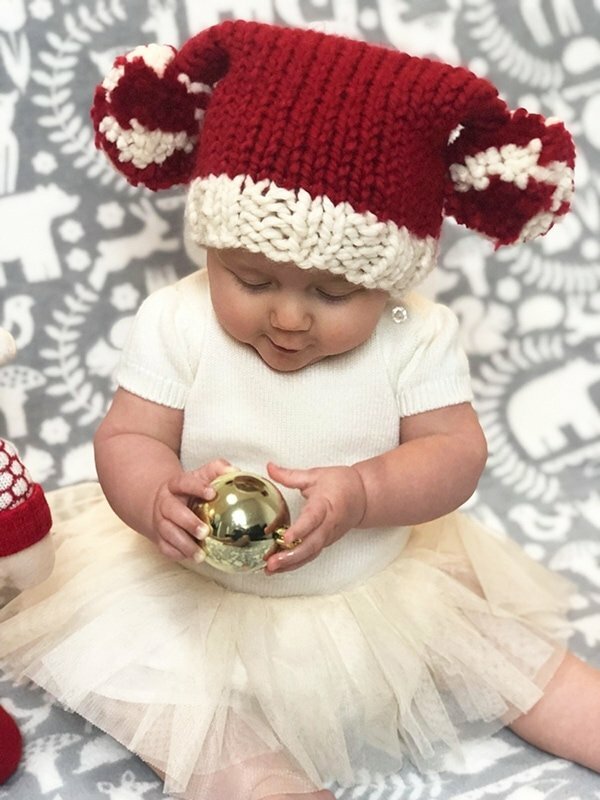 You can make this baby hat in the traditional colours or experiment with other festive colour combos. 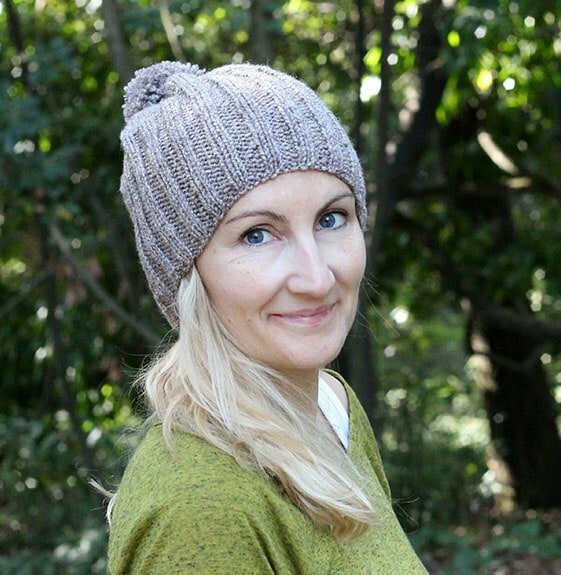 This free hat knitting pattern is great for beginners as it is simple to follow. 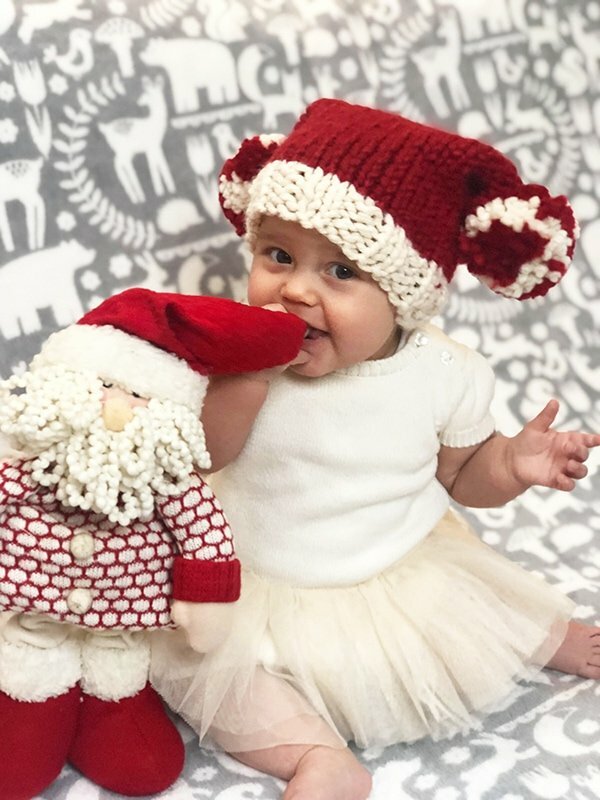 I wanted to design a Santa hat knitting pattern that was fun and whimsical, so I came up with this idea with two poms instead of one! This is the perfect accessory for holiday pictures, wearing to Christmas parties and to visit relatives for cuddles. This hat is pretty easy to knit, as it consists of alternating rows of Purl and Knit stitches, then the pom poms are sewn on afterwards. 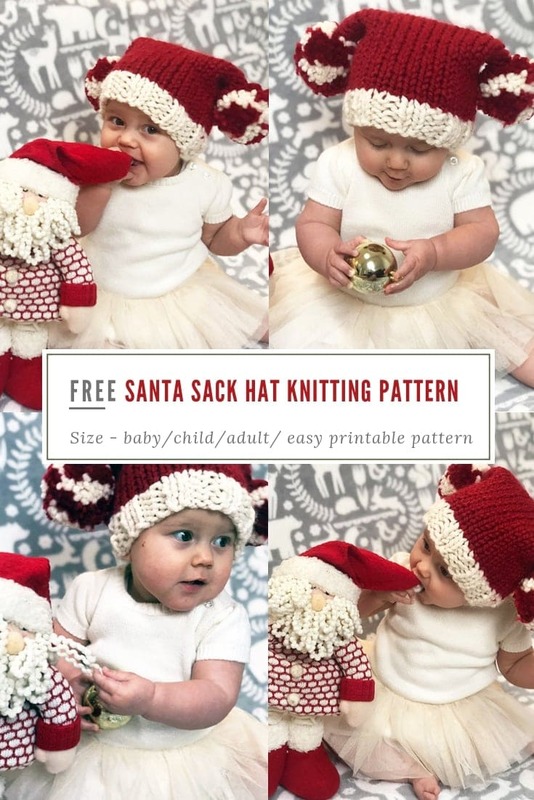 The Santa sack hat pattern is easy to make, knitting flat on straight needles. This means that there is seaming needed, you seam the sides of the hat, then turn the right side out. You will need a large pom pom maker to make the poms or if you are going for the traditional method there are many tutorials on Youtube. 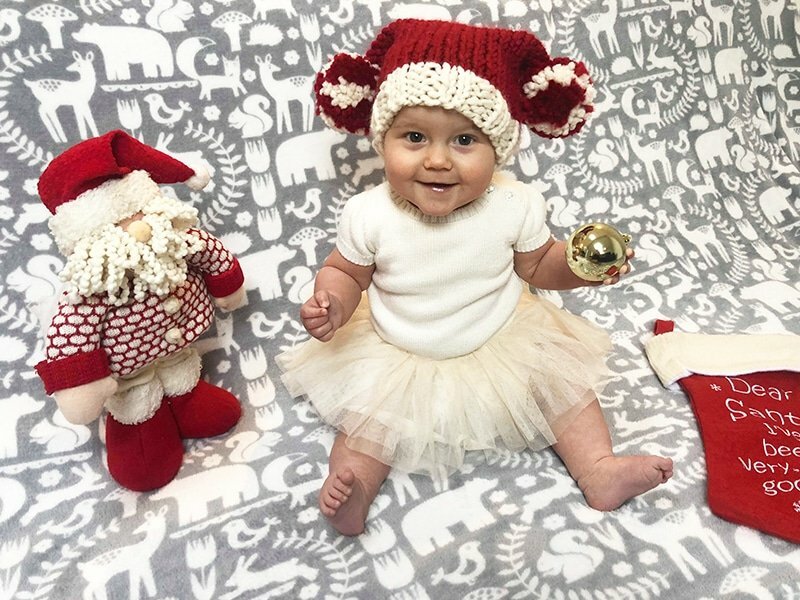 The baby Christmas hat knitting pattern is great for any beginners who are learning how to knit, as it is a quick project and great for stash busting. Any yarns you have leftover from other projects can be used up for the pom poms. 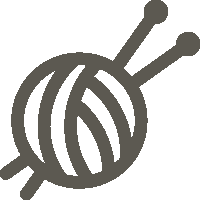 If you would like to make more knitted items/hats for baby, please take a look at the other patterns in the baby knitting pattern library. Make this hat with the easy to print out pattern below, then come back and let me know what you think in the comments or leave a review! 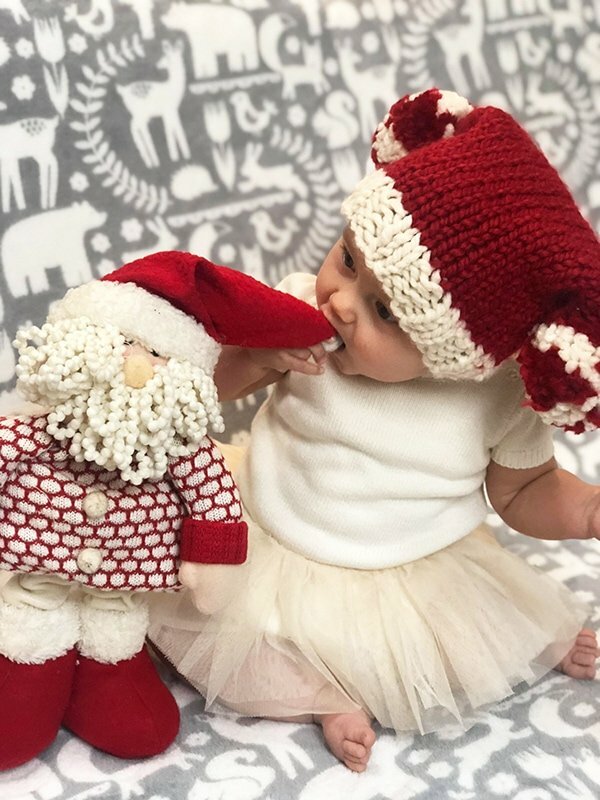 Make a festive Santa sack hat for baby this Christmas! 1 skein of red - Super Bulky Yarn 06 - Lion Brand Wool-Ease Thick or Quick or something similar. 1 skein (or leftovers) of white - Super Bulky Yarn 06 - Lion Brand Wool-Ease Thick or Quick in fisherman or something similar. K2, P2 rib for 1.5"
Fold the hat and stitch the side seams (you may prefer to do this turned inside out or with the mattress stitch). Make 2 pom poms and stitch to the folded corners of the hat and secure into place. 0-3 months - CO 16 / Circumference = 14-15" / Finished length = 11"
3-6 months - CO 18 / Circumference = 15-16" / Finished length = 12"
6-12 months - CO 20 / Circumference = 16-17" / Finished length = 13"
12-24 months - CO 22 / Circumference = 18-19" / Finished length = 14"
2T - 4T - CO 24 / Circumference = 19-20" / Finished length = 15"
5T to 12 years - CO 26 / Circumference = 20-21 /Finished length = 16"
Teens to adults - CO 28 / Circumference = 21-23 / Finished length = 17"
You may want to adjust the circumference/finished length depending on the recipient of the hat. Gauge - 6sts in 2"
Previous Post Christmas Decorating Ideas To Make Your Home Sparkle!